"Want to know why? I don't care about winning." A24 has debuted the first official trailer for Mississippi Grind, an indie drama from Sundance this year. Directed by Anna Boden & Ryan Fleck, the filmmakers behind Sugar, It's Kind of a Funny Story and Half Nelson, Mississippi Grind stars Ben Mendelsohn as a down-on-his-luck poker player who teams up with a younger player, played by Ryan Reynolds, in hopes of changing his luck. The cast also includes Sienna Miller, Analeigh Tipton and Robin Weigert. As much as I admire these filmmakers, and love these two actors, this doesn't look like anything besides yet another gambling-is-bad, try-to-get-out-of-debt but it goes wrong movie. This may be all about the performances. Down on his luck and facing financial hardship, Gerry teams up with younger charismatic poker player, Curtis, in an attempt to change his luck. The two set off on a road trip through the South with visions of winning back what's been lost. 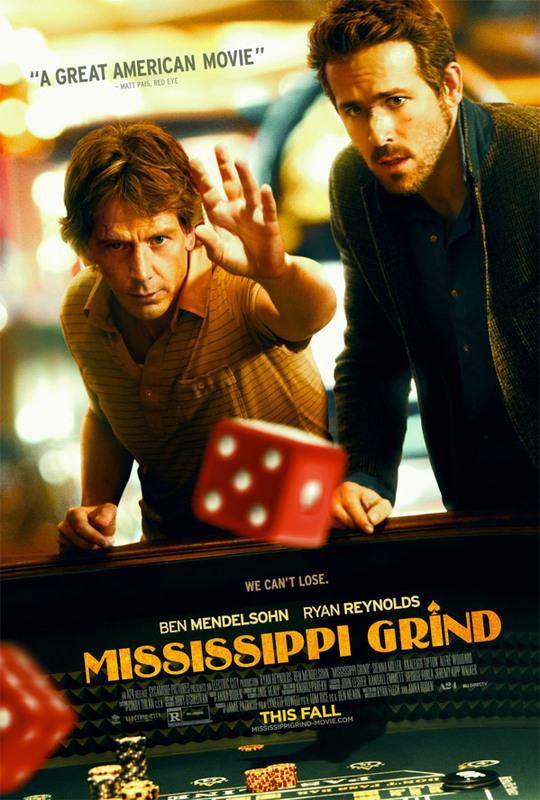 Mississippi Grind is both written and directed by husband-wife filmmakers Anna Boden and Ryan Fleck, of the films It's Kind of a Funny Story, Sugar, Young Rebels and Half Nelson previously. This first premiered at the Sundance Film Festival earlier this year. A24 will be releasing Boden & Fleck's Mississippi Grind in select theaters starting on September 25th later this fall. Interested? Ben has such an interested way of speaking. Almost like he talks out of the side of his mouth, I dig it. This looks pretty good. I may check it out when it hits VOD. Ryan Reynolds made GREEN LANTERN and lost his B-LIST status. He probably should've just stuck to rom-coms. To answer your question, anytime I get to see some very talented actors dig into roles like this, even if the story seems quite familiar...hell yeah, I'm interested. I love Mendelsohn but I was just thinking Rounders for this entire trailer. The pairing of Mendelsohn and Reynolds makes me think they're going for "gritty and light", respectively. Personally, I've never been able to take Reynolds seriously in anything. The guy is the king of flops. Awesome trailer. Didn't give enough away, but made me want to see more.